If you'd like to add a tropical flair to your garden, hardy hibiscus, at right, is just the plant you're looking for! 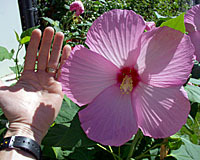 At least three native hardy hibiscus species have been used for many years as parents for dozens of hybrids. Hibiscus coccineus, or scarlet rose mallow, is native moist stream sides and swamps throughout much of the southeastern U.S. Meanwhile, Hibiscus moscheutos, the common rose mallow, and Hibiscus laevis, or halberd-leaved mallow, can be found in similar settings from Massachusetts, west to Wisconsin and Missouri. The August through September flowers of these plants are enormous - easily ten inches or more in diameter, at left! Depending upon the hybrid, flower colors range from white ('Blue River II,'), through pink ('Fantasia,' 'Lady Baltimore,' 'Sweet Caroline'), to deep red ('Lord Baltimore,' 'Fireball'). In addition to their dramatic late summer flowers, several relatively recent hybrids have been selected for not only their flowers but for their bronze-tinged foliage as well ('Fireball' and 'Kopper King'). There are a couple of things to keep in mind should you decide to add one, or several hardy hibiscus to your garden. First, they're herbaceous perennials. This means that they die back to the ground every winter and new shoots emerge from the ground in late spring - sometimes not until early June. Once they do emerge, they grow very quickly to heights and widths of four to six feet! Also, for these plants to bloom vigorously, they must be planted where they'll receive full sun all day, every day. As a bonus, they thrive in soils that are often damp to downright wet - yet also grow very well in quite dry, exposed sites once established. Finally, and unfortunately, Japanese beetles absolute love the leaves of hardy hibiscus and have been known to turn them to lace in very short order during the first couple of weeks in July! While this damage doesn't hurt the plants at all, it can make them hard to look at in late summer. 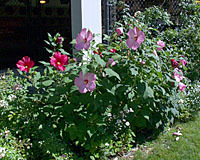 Providing you have the space for hardy hibiscus to thrive and are prepared to do battle against Japanese beetles, these plants can make a great addition to almost any Central New York garden.